I remember once reading in the newspaper about a woman who was walking down a rainy street in New York city when lightning struck a high rise apartment building, dislodging a potted plant. The plant plummeted 30 stories, striking the woman on the head. She died instantly. I know many people reading that would think " How horrible!" "How tragic!" but all I felt was a bit of envy. Not because I want to die, but because she had a storied death. A death worthy of the newspaper. 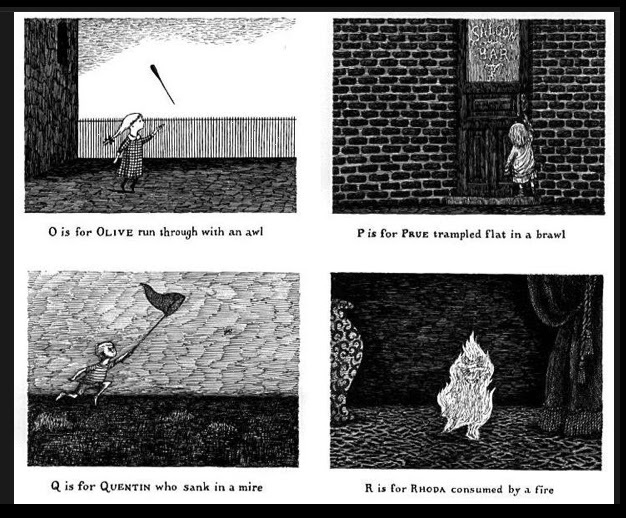 A death worthy of an Ed Gorey alphabet book. It was sudden, fast and interesting. Unfortunately this is not the way of the world. We will all die and for most it will be slow. My mother, father, and all four of my grandparents have passed on. My mother-in-law and all four of Mike's grandparents have also died. Of these eleven people, ten of them died slowly from an illness. Slow ailments that drained the life out of them like a leaky bathtub. Only my grandfather had an interesting story, not worthy of the newspaper, but interesting. He suffered a heart attack while driving in New Mexico. My quick thinking grandmother in the passenger seat grabbed the wheel and got the car safely to the side of the road. Then, in the time before cell phones, she managed to get an ambulance on the scene, but it was too late. However, we can't control how we die, (and no, I don't count suicide, depression is just another life-sucking illness). Some people however do lead storied lives. Lives worthy of a biographer. Sometimes I think my father was one of these people. He grew up in a mining town in Wyoming and like many gay men from that generation, he felt the need to hide who he was. He moved to New York, became a minister, married, and had children. He loved us, but he resented us too, so he drank. After my mother passed when I was in college, he began to take "holidays" to Amsterdam. It was after one of these trips he came home with his new husband, Danny, a young Dutch man, maybe 25 years old, just a year or two older than my brother at the time. He told our neighbors in the quiet New York suburb where I grew up that Danny was an exchange student, but it was quite clear that he was an ex-prostitute from Amsterdam's red light district. Danny had a tendency to dress in revealing and outrageous white leather outfits. He was wearing one when he stopped in on me and Mike in our tiny Manhattan apartment one day. I remember my father's shock and outrage when Danny was mugged in the East village that night. Danny was around for about 9 or 10 months. He even traveled to our family's lake house in Maine. Then one night he had a "sode". My father rushed him to the emergency room, where it was revealed that he had bipolar disorder. Even before 9-11, immigration officials didn't respond well to people who fail to mention their mental conditions on their visa applications. Anyway he was deported. We thought this was the end of Danny. My father, though, was devastated. It wasn't until I came home for the weekend and noticed his car was missing that I heard the rest of the story. My distraught father flew Danny to Canada and loaded him into the trunk of his car. He rolled up to the border smiling, and then got nervous. His foot slipped off the brake, the car rolled forward then lurched to a stop. My father, grinning and wearing his minister's collar was pulled from the car. Danny was discovered, my father was fined and his car was impounded. 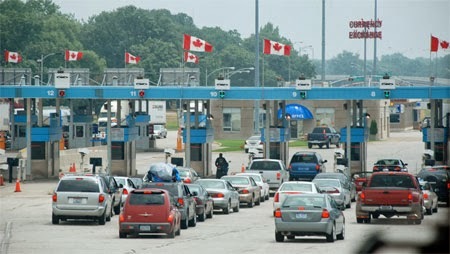 In the end, Danny found himself banned from not just one but two countries. When I was young I was angry with my father. For not being normal. For filling my life with drama and madness. Now that he's been gone for four years as of today I find that I miss the madness.